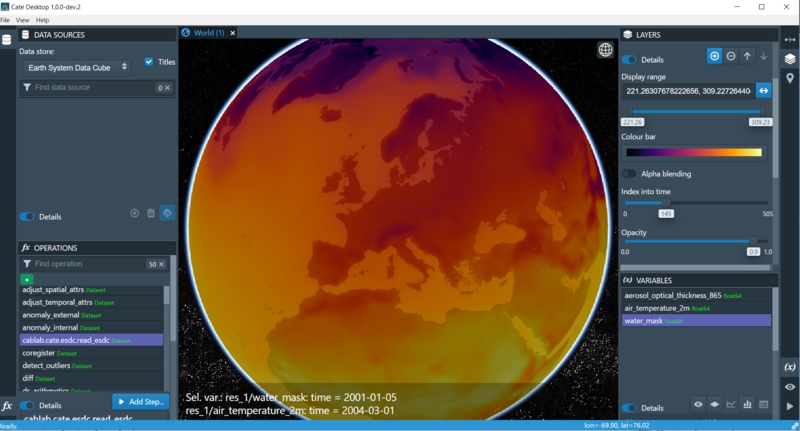 The Climate Analysis Toolbox (Cate) is a software environment for access, processing, and visualisation of all ESA Climate Change Initiative data. The toolbox works by mashing all CCI data into one Common Data Model, which greatly facilitates the exploitation across all variables. Users can select between three different interfaces to Cate. A command line interface allows for the establishment of batch scripts for reproducible and efficient processing. In addition, Cate can be seamlessly integrated into users’ Python programs through the Python API and users may even add their own functions to the toolbox. Cate Desktop is a powerful Graphical User Interface that provides Cate’s full functionality in a desktop environment. 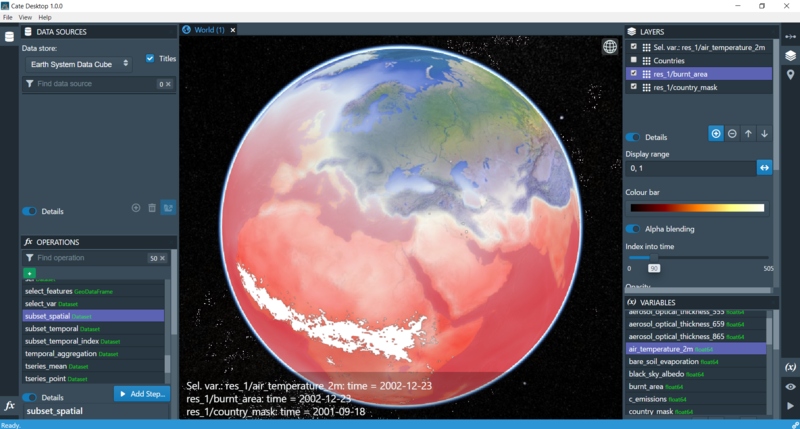 Cate’s impressive visualisation capabilities enable the user to easily dig into the data, thus fostering an intuitive understanding of patterns and dynamics in the data. A set of typical operations facilitates data analysis and processing and the results of such operations can be instantaneously visualised or serve as inputs for further processing. Cate is continuously evolving and we maintain an active dialogue with our users to improve functionality and user experience. Visit the Cate website for further information, support, and the latest release of the software.